Me: Are you done with your homework? Me: Do you want to watch an episode of West Wing and have some homemade chocolate chip cookies? Bryan: Mmm. Yeah, that sounds really good. Bryan: Wait a minute. We don't have any homemade chocolate chip cookies. Me: I know. Want to make me some? That's basically how it went down last night. But when we started making chocolate chip cookies we didn't know we were going to be making super yummy double chocolate chip cookies. Yummm. We live at a high altitude and I can honestly say that I haven't made a truly good batch of cookies the entire six years I've lived here. Sad, but true. I make ok cookies, but they're nothing to get overly excited about. That is, until a couple weeks ago. On a whim, when I was mixing up some chocolate chip cookie dough a couple weeks ago, I decided to throw in a packet of instant pudding before mixing the flour in. I've seen a few other recipes that do this and while I'm not super nuts about those recipes in particular (I'm a pretty basic girl), I thought the pudding mix thing might be worth a try in my regular recipe. And I was right. Adding the pudding mix was a major hit. 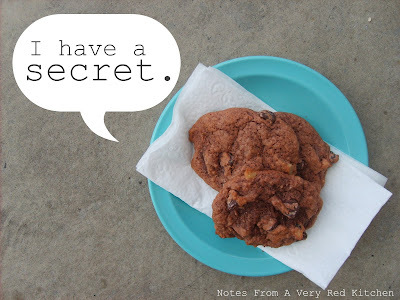 It made the cookies super soft and wonderful--the epitome of yummy, dreamy, homemade chocolate chip cookies. Score. So last night when we were mixing up a batch of the ol' CCC's (chocolate chip cookies) I asked Bryan to grab a box of pudding mix to throw in. But he said we were out. OUT?! Well, sort of. We were out of vanilla and white chocolate and the kinds of flavors that just blend in nicely without really being noticed. The only flavors left in our pantry were cheesecake and chocolate. We thought cheesecake might be a little weird, so we decided to take a chance and go with the chocolate pudding mix. The result? 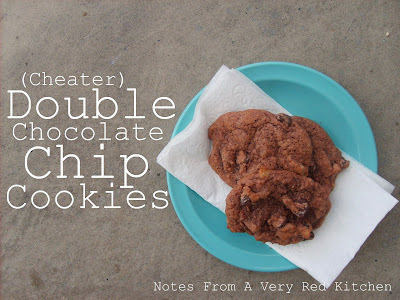 Instant double chocolate chip cookies. Who knew that making double chocolate chip cookies (and soft and wonderful ones at that) could be so easy? I definitely didn't. So you want to know how to make a batch of these bad boys yourself? Oh, and in case you're curious, my go-to CCC recipe is the one in the red and white checker Better Homes and Gardens Cookbook. These bad boys are pretty addicting. You'd better package some up and give them to all your friends. Just put them in one of those cheap fold-over plastic baggies, pinch the open top together, and tie a stringy scrap of fabric around it. Oh, and don't forget the tag. They're gonna want to know who it's from. Cuz' they're gonna want the recipe. Yum. So is this Mom's old recipe you add them to? or a different recipe? Oh, I wish my hubby could eat chocolate. If I made these, I'd probably eat them all myself. They look wonderful.